Grand Deluxe rooms at the St Regis Hong Kong offer city and partial harbour views. 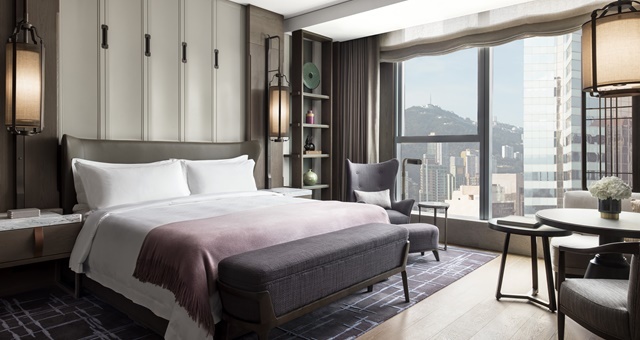 A global milestone has been set, with Marriott International this week opening the doors to its 7,000th hotel globally in the form of the St Regis Hong Kong. The company’s latest opening comes in the same week that it declared it will attempt to reach its 1,000th hotel in the Asia Pacific region by the end of 2020 – aiming to create more than 150,000 jobs in so doing. The new St Regis Hong Kong is housed within a 27-storey high-rise and offers 129 rooms. Guests have access to private in-room check-in and the brand’s signature butler service which includes packing and unpacking, beverage services and garment pressing. “I can’t think of a more fitting property to hold the honour than The St. Regis Hong Kong, which underscores the benefits of our merger with Starwood, the importance of luxury and the tremendous opportunity in Asia,” said Marriott International President and CEO, Arne Sorenson. Guest facilities at the new St Regis Hong Kong include French fine-dining haute cuisine at L’Envol as its main dining offering, led by Executive Chef Olivier Elzer, who holds 24 Michelin Stars in his resume. Additional dining options include Cantonese restaurant Rùn, afternoon tea venue The Drawing Room and the signature St Regis Bar, which will serve the brand’s iconic Bloody Mary cocktail using local ingredients including dried tangerine peel and Kowloon soy sauce. Event planners will have access to over 1,100 square metres of space over five venues including the Astor Ballroom and the more intimate Rockefeller Room for corporate meetings. Guests can also access an outdoor verandah, heated swimming pool and poolside bar, fitness centre and spa offerings.